Daily problems with finding parking spaces are unfortunately part and parcel of our lives. In Poland alone, the number of cars per inhabitants is one of the highest in Europe. Therefore, it’s worth ensuring convenient parking with the use of the free and easy-to-use social networking app named winkPark. It will enable you not only find out about available parking spaces in your preferred locations, but you will be also able to make new friends and take advantage of additional features which will enhance your mobility in the city. And much more! winkPark is an innovative application which is meant to make drivers’ lives easier. The idea behind the system is to create a community which will be helping one another, and jointly ensure that the urban space is friendly and, above all, less crowded. winkPark also focuses on ecology as using the app means that less exhaust is emitted into the atmosphere. It takes only a login with a password to get registered in the app. Once this has been done, just enter your car’s registration number, its make and colour as it will enable other winkPark’s users recognize you. You can add several cars to one profile, but remember to set one of them as default. Then go to “My Profile” tab to set a nickname and add your avatar. When you start with winkPark, we give you 3 “lives”. They can be lost if you cancel a sparking space after you have marked it as “available”. Any lost lives are revived after 24 hours. There are two ways within winkPark to let other drivers know about available parking spaces. One is to mark such a space by clinking the blue button on the main app’s screen. A pin appears on the map, marking your location. Depending on your needs, you can move the pin, or not. If the location suits you, click the “Announce” button. With this, other drivers will see a blue marker on the map informing them about an available parking space. You can also choose to wait for another winkPark’s user. 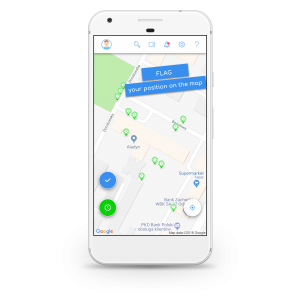 All you need to do is to add your position on the map using the green button with the flag, set the time between the current time and your departure, and wait for the other driver to arrive. In both functions, you can select the details of the marked parking space using a dropdown list: whether the space is payable, for drivers with disabilities, for electric cars, or for large vehicles. Also, you can park quickly using other drivers’ help after they’ve they marked available parking spaces. 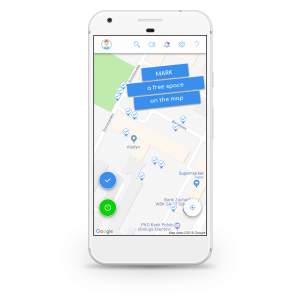 For this, just click on the blue marker corresponding to your location on the map, and the application will show you the route. You can also make an appointment with the other driver. Just click the selected green marker and the “Make the Booking” button, and the app will display the detailed information about the parking space, and the route to reach it. • Adding other app’s users to the ‘Friends’ group. They fall between three different sub-groups: those being followed, those who follow, and those who have been blocked. So, winkPark is more than an app: it is a whole platform which combines many services. winkPark: let’s park together!